The ancient city stands out with its Athena Temple, Demeter Temple, Zeus Temple, Upper Gymnasium, Lower Gymnasium, Egyptian Temple, Byzantine church, agora, theater, bouleuterion and residential areas. Priene, known as the "Pompeii of Anatolia" due to its well-preserved and surviving works in Söke district of Aydın province, saw an increase in the number of visitors after being included in the UNESCO Temporary World Heritage List. The ancient city built on a steep rock at an altitude of 370 meters to the south of Samsun Mountain 15 kilometers from the city center is undergoing excavation works with Prof. İbrahim Hakan Mert, a scholar from Uludağ University leading the efforts. The ancient city was included in the Temporary World Heritage List on June 6 and stands out with its Athena Temple, Demeter Temple, Zeus Temple, Upper Gymnasium, Lower Gymnasium, Egyptian Temple, Byzantine church, agora, theater, bouleuterion and residential areas. Speaking to Anadolu Agency (AA), Prof. Mert said first excavation works were carried out by a German team in 1890 and later the excavations restarted in 2014. The most important traces in the city belong to the Hellenistic time and there are also structures belonging to Roman and Byzantine periods. Priene was one of the most modern urban design examples of its time. Priene was one of the most modern urban design examples of its time. "This is one of the places where the urban planning system developed by Hippodamos, an urban designer born and trained in Miletus, has been ideally implemented. It is the place where a city plan consisting of north to south streets that cross each other perpendicularly has been applied. It has been well preserved. Due to this preservation, it is likened to the ancient city of Pompeii in Italy. It has been included in archaeological literature as Pompeii of Anatolia. It is a city containing the most typical structures of the Late Classical and Hellenistic period," Prof. Mert explained. He also noted that the excavation works have been focusing mostly on the ancient cemetery this year and that they have been discovering important facts about the culture of the region in this section defined as the city of dead. Heritage List. "This will play an important role in the promotion of the ancient city. We are expecting more visitors. According to the latest data, the increase is obvious. We will continue our efforts to enter the permanent list," said Mert. Ramy Atassi, one of the visitors from France said that they have been visiting places on the temporary and permanent list of UNESCO World Heritage List in Turkey and that is why they came to Priene. He emphasized that the city has a fascinating structure and added, "We have found it impressive. We really respect those who built this city. We think it is one of the most beautiful examples of the period. You visit that periods when you enter inside." His sister Diana Atassi said that with its nature and ancient feel, Priene left an impressive impression on people. Hüseyin and his wife Bahar Güdek from Samsun further noted that the works have been preserved properly and said that it was peaceful to be in such a place in nature. 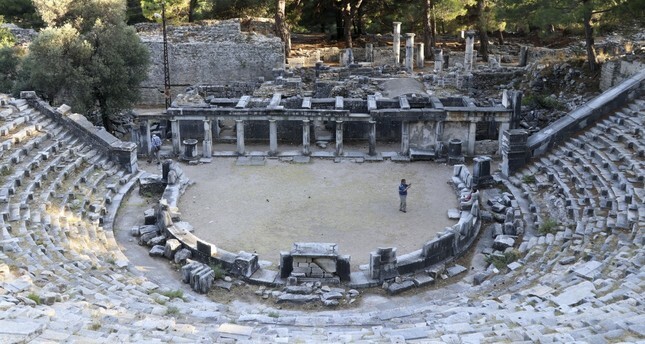 According to the data from the Museum Directorate, Priene hosted approximately 10,000 visitors last year. After it was included on UNESCO's list, about 8,000 people visited the ancient city only in three months.